Speak to a Heritage professional today. Homeowners sometimes contact Heritage staff to discuss how they might transform their older home in a manner that is cohesive with the existing property but also meets their modern-day needs. Sometimes, that transformation includes increasing square footage by building an addition. The Heritage Home Program has assisted numerous homeowners with design ideas that are compatible with the existing home, as well as financing to get the project done. Site Visits provide the opportunity to have an introductory conversation about what would be appropriate for the age and architectural style of the home and what could be funded using the Heritage loan. Homeowners and Heritage staff begin by discussing possible options for layout, placement, scale and materials for new construction. Heritage staff can also provide homeowners with guidance on bidding out the work to various contractors, and review estimates along the way. 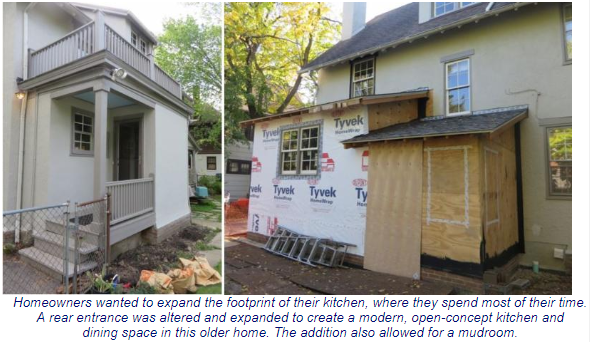 This Parameters for Additions one-pager provides homeowners with information on the components that are taken into consideration when reviewing addition designs on older homes.